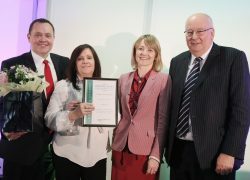 Every year, Greensleeves Care Awards celebrates the wonderful and hard work of their staff across the business. On 25th April 2017, a gala lunch was held at the Kia Oval in South London and was attended by staff from all 20 homes. Compass Associates were delighted to sponsor the Manager of the Year award category which, this year, was awarded to Anne Maas, Home Manager of Broadlands. Congratulations to Anne, and all of this year’s winners and nominees. Compass Associates End of Quarter celebrations are an opportunity for the whole company to join together to celebrate our achievements from the last quarter. When it comes to celebrating the end of our Financial Year, we like to do something a bit special. 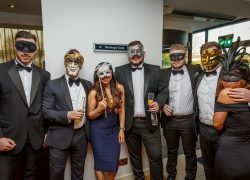 The end of year was celebrated in style with a Masquerade Ball at the Portsmouth Marriott hotel. Staff were welcomed with Buck’s Fizz and canapés whilst showing off their beautiful masquerade masks. During a sumptuous 3 course meal of Ham Hock Terrine, Garlic Roasted Chicken and Bailey's Profiteroles, Caricaturist, Christian Marshall from Sensible Pencil, captured everyone’s likenesses to a tea. Award winning close up magician Maximilian Magic also wowed and amazed all with his incredible tricks. 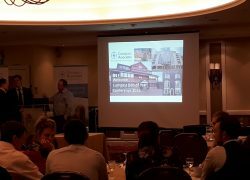 On Friday 7th April, we held our End of Year conference at the Marriott Hotel, Portsmouth. The conference is a great way to bring the whole business together to talk about the previous year, update everyone on each division and regional office and our direction for the future. The Directors also take this opportunity to recognise employees within the business who embody the Compass Associates Core Values in their day to day working. Our Core Values are what differentiates us from our competitors and defines who we are as a business.